The Yorkshire Agricultural Society has undergone its first major brand overhaul in its distinguished 182-year history. A new look, consisting of a new purple and yellow logo that spells out the Society's name and a new website, has been adopted by the Harrogate-based charity which has existed to support and celebrate the region’s farming industry since 1837. Nigel Pulling, chief executive of the Yorkshire Agricultural Society. The Society's traditional green and gold crest, featuring the white rose of Yorkshire as its centrepiece, will still be used "when appropriate", the Society said, but the new logo gives the charity a modern look that it says translates better across media platforms including mobile phones. A key reason behind the change was also to make the Society's name far clearer, with the crest only featuring the wording in small letters around its outside. Created in 1837, the Society was established to celebrate and support the farming industry, with its first task to create a large-scale event, the Great Yorkshire Show. 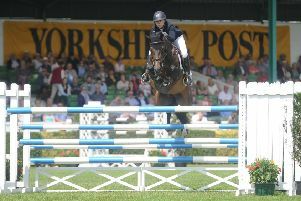 It now attracts 130,000 visitors over three days each July, attracting Britain's finest livestock and equine competitors as well as Royal guests and industry leaders. The new Yorkshire Agricultural Society logo, revealed today. Nigel Pulling, chief executive of the Yorkshire Agricultural Society, said: “A new logo and a new website will drive the Yorkshire Agricultural Society forward as well as promoting more prominently the work it does. The new website opens with the story of the Society, which has been created by Leeds animation studio Northforge. The two-minute film - which can be viewed at the top of the page - sets out to showcase the ways in which the Society encourages, promotes and supports agricultural communities. The new logo can be seen at the end of the film. 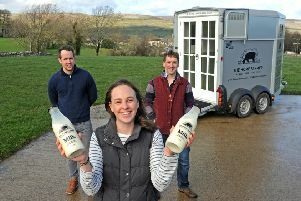 At this year's Great Yorkshire Show - on July 9-11 - there will a new exhibition stand to tell the Society's story and to showcase the work it does throughout the year, from holding farmer health checks and education days to running Fodder, its farm shop and café at the showground, as well as operating Pavilions of Harrogate and Yorkshire Event Centre as events venues.